CMTC’s supply chain consulting services offer California manufacturers a results-driven way of quickly focusing on the critical areas of the supply chain with an approach that is strategic and constraints-based. This approach focuses on the entire supply chain rather than individual suppliers and is intended to improve the supply chain’s speed of delivery, improve collaboration, reduce risk, and decrease overall total cost. Manufacturers leveraging this type of optimization can expect to be better positioned to develop, source, manufacture, and distribute superior products at lower total costs, while simultaneously increasing revenue, profits, and shareholder value. Today’s integrated and complex supply chains require careful coordination and alignment with overall business strategies. By deliberately analyzing the entire supply chain, CMTC helps California manufacturers uncover otherwise hidden value between supply chain functions and partners. As the economy evolves and supply chains grow in complexity, manufacturers must be cognizant to new risks such as cyber warfare, in addition to long-standing risks posed by natural disasters and economic disasters. CMTC’s risk management services help ensure consistent supplier and distributor relationships, intelligent and agile risk management strategies, and risk management investments that provide optimal ROI. Increasing customer expectations, market pressure and fierce competition means supply chain optimization is paramount for manufacturers to thrive in the 21st century. 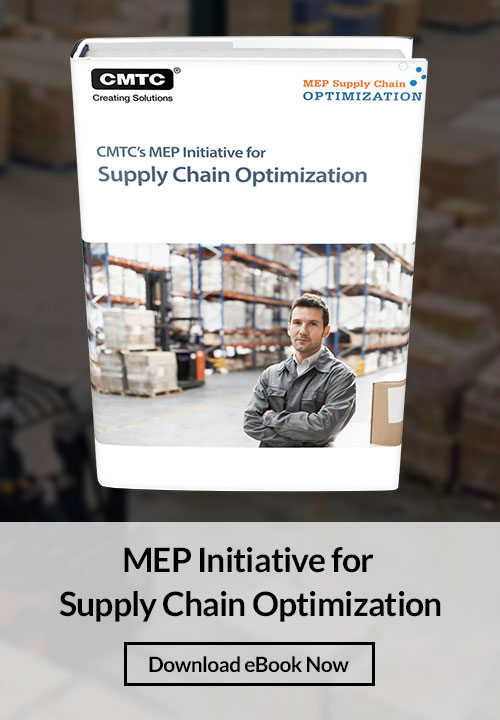 CMTC’s supply chain optimization services leverage a team of experienced industry professionals and modern tools to address areas for improvement, including network optimization, carrier management, inventory optimization and more. Developing an effective value chain is fundamental to the success of any business and should be included as part of a company’s strategic planning initiative. CMTC’s supply chain consultants help California’s small and medium-sized manufacturers develop their value chain by focusing on areas including research and development, product design, production process optimization and distribution management. To succeed in today’s competitive marketplace, products are required to possess innovative features without sacrificing quality and affordability. CMTC’s collaborative product development consulting helps manufacturers improve decision making to increase product design and development speed, improve product quality and ultimately differentiate themselves as a leader in the marketplace. Total Cost of Ownership (TCO) is a concept that examines all of the costs related to the acquisition, transportation and storage of products within the supply chain. CMTC’s supply chain management consultants help manufacturers conduct a thorough TCO analysis by examining shipping costs, shipping time, quality costs, inventory costs and more. CMTC’s strategic sourcing and logistics services help California’s manufacturing companies identify and seize opportunities in areas such as productivity, materials management, transportation, packaging and more. Understanding The Demand/Capacity Curve: Why is it So Difficult to Work With Intercompany Suppliers?